Hiring a professional to handle the washing of your patio will bring you fast and effective results. Cleaning paved, tiled and natural stone surfaces requires using heavy equipment and having the necessary skills to do the work. Our cleaning technicians can make your outdoor garden and patio areas rid of the stains, darkening and weeds. 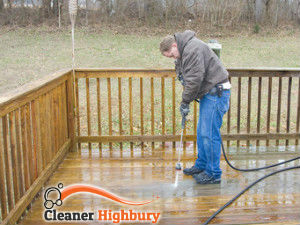 We carry out some of the best patio cleaning services in Highbury, N5 which are tailored to the individual needs of each customer. Just give us a call and we will send any of our cleaners to your property to check its patio and prepare you a quote for approval. Efficient and comprehensive removal of mud, stains, dark spots, paint splatters, etc. By hiring our cleaning technicians to sanitise your filthy patio you will save yourself the stress, time and hassle of doing the work yourself. Our staff utilize modern and effective machines for pressure washing which can be used with cold and hot water under pressure. Some stains, dirty areas and tiles may need hot pressure washing under low pressure. In case you can’t provide access to hot water our staff can use cold water under high pressure to achieve the desires effect. Make an appointment with any of the cleaners in our company and they will provide the patio cleaning you need in your home or business property, based in N5 or in the surrounding areas. If you plan to put your property on the market or rent it out our pressure washing services will make it more attractive to potential customer and increase its value. 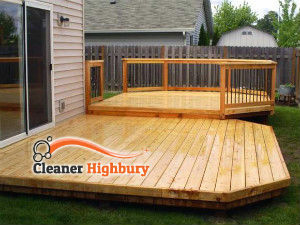 We offer affordable and unrivalled patio cleaning services in Highbury to proprietors and landlords.